After their arrest at Crown Entry in 1936, the senior IRA men charged and found guilty of treason felony had agreed on a campaign for political status after they had been sentenced (this happened on 22nd July 1936). Sean McCool was O/C of the republican prisoners in Crumlin Road at the time, while Tony Lavery was section O/C of B wing. Their first step was to go individually to the prison doctor to demand they receive the Ordinary No 3 Diet. At the time there was a rumour that all republican prisoners would be freed at the time of the upcoming coronation in London (there were twenty-three political prisoners in Crumlin Road at the time). This acted as a brake on taking action which unfolded relatively slowly over the next few weeks. Ironically, there was equally a rumour that the long term prisoners in A wing would be moved to Peterhead in Scotland which was designed as a penal settlement (while Crumlin Road was only designed for short term prisoners). McCool and Lavery (as O/Cs of A wing and B wing) then both went to the prison governor, Stephenson, to again demand No 3 Diet, association, razors, Irish books, a letter a week and visit a month. By the middle of August there was no clear decision on further action and Lavery wanted to be replaced as O/C (he intended to hold no rank in the prison and to resign from the IRA on his release). The prison chaplains were also refusing sacraments to the IRA men. Eventually, on Sunday 16th August, McCool passed a copy of their demands to Lavery (see below). NIne demands made by republican prisoners, Crumlin Road, 1936 (from Tony Lavery’s diary, PRONI Ha 32/1/635). The prisoners in A wing agreed that there would be a no work protest from the Tuesday against the conditions under which they were being held prisoner and that every prisoner who felt able to would commence a hunger and thirst strike. Mick Traynor also took over as O/C in B wing. On the day the protest started, each informed the warder who opened his cell that he wasn’t going to work that day . He was told he would be reported and was locked back into his cell. A short time later, half a dozen warders and the Chief Warder appeared at the cell and asked him to go to his place of work. He again refused and was physical removed from the cell and brought to his place of work in the yard. Jimmy Steele, Sean McCool, Jim Killeen (being held as James Grace), Mick Gallagher, Mick Kelly (being held as Michael O’Boyle) and Johnny McAdams stood where they were left in the yard by the warders and refused to do any work. They were rounded up by the warders and brought back to the circle where they were held whilst their refusal was reported to the governor. Next they were summoned to the governor’s office. Each prisoner was asked why he was refusing to work and they told him that it was a protest as he was a political prisoner, not a criminal, and had been sentenced and charged under a political offence, the Treason Felony Act of 1848. They each demanded political treatment including their own clothes. Stephenson replied that there was no provision for political prisoners in the jail. He ordered one month of punishment on number 2 Punishment Diet. On return from the governor’s office each republican prisoner discovered that his cell had been stripped of the table, stool, bed board, mattress, blankets, a basin, dustpan, brush, mugs, comb and spoon. The bed board, mattress and blankets were removed between 7.30 am and 8 am and only returned at 8 pm or so. The number 2 Punishment Diet of bread and water for breakfast, potatoes for dinner and a half pint of porridge for tea was delivered directly by warders to each cell. Those on punishment also had a loss of exercise. After the A wing prisoners went through this, the B wing men suffered more or less the same consequence for a refusal to work. It is clear that there was no consensus among the prisoners on whether all, or indeed any, of the demands, would be met. The most realistic scenario was that if the prison authorities breached normal prison rules and protocol to treat with them, this was tantamount to recognition of their political status (i.e. when they started collective negotiations rather than dealing with them as individuals). The hunger and thirst strike also began on the Tuesday (18th August) with eighteen of the twenty-three republican prisoners in Belfast Jail participating (everyone except the juveniles, Mick Kelly and Tony Lavery). Hunger strikes were not a new tactic in Belfast Jail, with Patrick Cavanagh having carried out a five day hunger strike there the previous year. The Crown Entry men included veterans of various jails, north and south, and prison protests including hunger strikes (including those who had been arrested at Gyles Quay and imprisoned in Arbour Hill the year before). Given the high profile of some of the prisoners, such as Jim Killeen and Sean McCool, there was the prospect of publicity, and it would be hoped, widespread sympathy for meeting their demands. 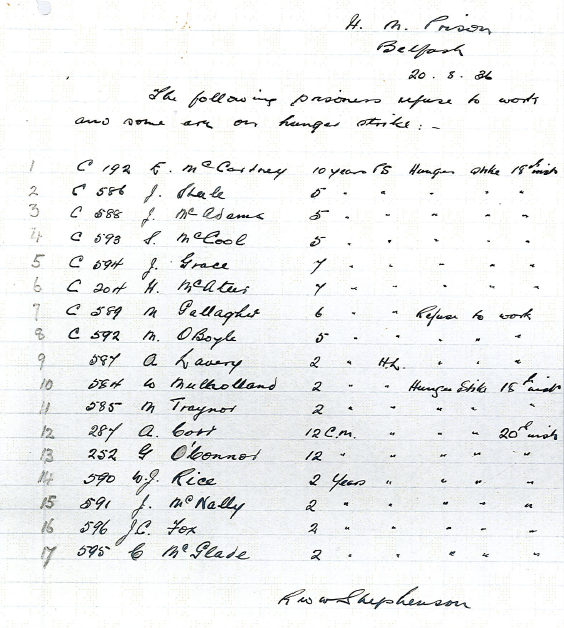 Governor’s note to Dawson Bates listing status of republican prisoners in Crumlin Road on 20th August 1936. While the nominal demand was one visit and one parcel per month, the real focus of the protest was to establish that principle of there being a political liaison between those imprisoned and those in charge of running the prison. Other issues, such as the refusal to work, could be dealt with by non-compliance, relying upon the warders on the ground to ignore non-participation in work in return for a quiet life. Warders who wanted to enforce the rules and compel prisoners to work would not only require confrontations to enforce this, but also co-operation from their own colleagues. It seems that the desire for a quiet life could be relied upon to gloss over refusals to participate in work where that was done by simply not doing the work, rather than openly refusing to work. Some work, which related to the prisoners own comforts, such as the cook house and laundry, appeared to have been exempt from the protests. On the Friday, three days into the hunger strike, Jimmy Steele told Mick Traynor that he was ‘going the whole hog’. On the Saturday after the hunger and thirst strike started, the A wing men were visited by the Chaplain who was nominally coming to give them the Catholic sacrament of confession. On advising them that a hunger and thirst strike ran contrary to the teachings of the Catholic church, he refused absolution. After he had been to A wing, the chaplain paid Jack McNally and the others a visit in B wing. He similarly refused absolution to them and also informed him that the A wing men had come off the thirst strike (which wasn’t true). It is clear from McNally’s memoirs that the protest began as a hunger and thirst strike, rather than a conventional hunger strike although contemporary press sources generally refer to it as a hunger strike. With some prisoners on a hunger and thirst strike, it put immediate pressure on the authorities to consider concessions. Whether it was agreed beforehand or left to a certain amount of chance, the decision to begin with everyone on a hunger and thirst strike appears to have been tactical. A hunger and thirst strike could potentially see fatalities after the first week and gave the authorities little opportunity to ignore the protest. Having raised the stakes so high to begin with, those on the protest then began taking water again on the Saturday, the fifth day. This, in effect, took the protest down a gear. The change in pace allowed the prisoners to gather their strength for a more protracted battle of wills. It also offered some respite to the authorities after the stress of a potential fatality on a hunger and thirst strike. It didn’t offer much respite to the hunger strikers, though. Anyone who has participated in a hunger strike is quick to dismiss the idea that somehow the hunger pangs leave as the lack of food normalises. Apparently, the hunger persists every day from the beginning of the strike and presents a constant challenge to the discipline and motivation of the hunger striker. That Saturday afternoon, McNally was visited by a warder and the deputy prison doctor, Dr McComb. After examining McNally he directed the warder to bring him down to the prison surgery, McComb found that his kidneys were not functioning properly. McComb then gave him a glass of water with some powder dissolved in it. The doctor also ordered that McNally be allowed an hours exercise a day on medical grounds. Back in his cell, McNally still refused the food on Sunday morning but drank the water. At 2 pm on the Sunday, the authorities began to negotiate. A Catholic warder, called Murphy and nicknamed the Blind Man, brought an offer from Allingham, the chief warder. If they called off the protest, their cards would be marked as if they had been at work all week (this is taken into account when it comes to remission and shortening the sentence). McNally told Murphy that he would have to meet the other Crown Entry men held in B and C wing to discuss the offer before he could respond to Allingham or the governor Stevens. Allingham directed Murphy to assemble the men in B and C wing, and, that he would meet McNally to discuss the matter. McNally immediately noted the fact that Allingham was at work on a Sunday and agreed to collective negotiation as evidence that the authorities were taking the protest seriously and was a form of political recognition. They all agreed that they would allow themselves to be brought out to work the next day, whilst remaining on the number 2 Punishment Diet. While they would be on a go slow, or not work at all, this would be disregarded. They would keep privileges like attending the lectures and Friday night concerts. Next Murphy brought McNally’s response to Allingham that he would meet him. When Allingham agreed and met him on the Sunday evening, McNally considered it as a step towards political recognition. The Crown Entry men on B wing regarded this as a moral victory. The hunger and thirst strike had lasted to its fifth day. Over on A wing, the protest had stepped down a notch, but it wasn’t over. The demand for a visit and parcel a month still remained and the Crown Entry men were now taking water, but refusing food, and it was day six of the hunger strike. The authorities had not conceded the point yet and the scene was apparently set for a more protracted hunger strike. By 1st September, on day 16 of the hunger strike, Sean McCool and Jim Killeen had come off the strike (this was reported in Irish Press on 4th September) and only Jimmy Steele remained on hunger strike. The logic of Steele staying on the hunger strike was likely to promote support in Belfast in a way that perhaps Killeen or McCool might not have attracted. In the event that he grew weak, it left Killeen and McCool in a position to negotiate with the authorities. But Steele’s body was already weakened by refusing food and having had pleurisy and lung congestion the previous year. After the initial hunger and thirst, he had already started to show further signs of problems. By the 3rd September, day 18 of the hunger strike, his condition had weakened sufficiently that his brother Bill was summoned by the prison authorities. Despite the health problems, he insisted on staying on hunger strike until the demands were met. The demands were still that they would receive one visit and one letter a month from relatives. Finally, he came off hunger strike on the Saturday morning, the 5th September, the 20th day of the hunger strike (this was reported in the Irish Press on 7th September) as a deal appeared to have been brokered. On Monday, the 7th September, the A wing men expected to be in a position to receive a visit (according to newspaper reports in October the authorities had even agreed to weekly visits but that wasn’t part of the demands). Over the course of the next week the authorities appear to taken a different interpretation of whatever was agreed before the 5th, or simply chose not to honour it. Having just completed five days on hunger and thirst strike, followed by fifteen further days of hunger strike, Jimmy Steele went back on hunger strike on the 17th September. Given his weakened condition and the problems with his lungs, his continuation of the protest raised the stakes. His condition continued to worsen and he was transferred to the prison hospital. His brother Bill and others attempted to get in to see him, whilst political figures like Harry Diamond tried to get permission for family members to get in to see him. They also requested that he be treated by an outside doctor. In the end, severely weakened, Steele came off the hunger strike on 30th September. It was the fourteenth day of his second hunger strike and he had been on hunger or thirst strike for thirty-four of the last forty-five days. He remained in the hospital for some time. Mick Traynor, who took part in the hunger strike in 1940 that saw the deaths of Tony D’arcy and Jack McNeela, said that compared to 1940, the 1936 protest was a ‘cantering strike’. However, Jimmy Steele was later to record how the hunger strike had impacted significantly on his lungs which were to remain a problem for the rest of his life and lead to intermittent bouts of ill-health. If any person whatsoever shall, within the United Kingdom or without, compass, imagine, invent, devise, or intend to deprive or depose our Most Gracious Lady the Queen, from the style, honour, or royal name of the imperial crown of the United Kingdom, or of any other of her Majesty’s dominions and countries, or to levy war against her Majesty, within any part of the United Kingdom, in order by force or constraint to compel her to change her measures or counsels, or in order to put any force or constraint upon or in order to intimidate or overawe both Houses or either House of Parliament, or to move or stir any foreigner or stranger with force to invade the United Kingdom or any other of her Majesty’s dominions or countries under the obeisance of her Majesty, and such compassings, imaginations, inventions, devices, or intentions, or any of them, shall express, utter, or declare, by publishing any printing or writing . . . or by any overt act or deed, every person so offending shall be guilty of felony, and being convicted thereof shall be liable . . . to be transported beyond the seas for the term or his or her natural life. Jack McNally notes (in his memoir Morally Good, Politically Bad published in 1989) that the sentencing provision under the Act (as quoted above) was transportation for life. This was amended (under an 1857 Penal Servitude Act) to the equivalent term in penal servitude. This provision seems to have been in force in the 1930s and 1940s meaning, somewhat ironically, that the sentences handed out by the northern government’s courts were unconstitutional. The list is complied from contemporary newspaper accounts but is not neccessarily exhaustive as it relies on the charges under the Treason Felony Act being reported alongside more conventional charges such as possession of firearms. Arrested in an RUC raid on an IRA meeting at 10 Crown Entry, Belfast on 25th April 1936. Having been savaged by the National Council for Civil Liberties for its oppression of opposition and, in particular, its draconian use of the Civil Authorities (Special Powers) Act, the northern government chose to use an archaic piece of legislation, the 1848 Treason Felony Act, to prosecute those present. The IRA members were present nominally to hold a courtmartial of Lavery, then the Belfast IRA O/C, but it seems equally likely that a gathering of most of the senior IRA commanders in the area under northern government control was to cover a much broader agenda. This may have included the possibility of a major campaign inside the north. …divers other evil disposed persons feloniously and wickedly did compass, imagine, invent , devise and intend to deprive and depose our Lord the King from the style, honour and royal name of the Imperial Crown of Great Britain, Ireland, and of the British Dominions beyond the Seas, and the said felonious compassing, imagination, invention, device and intention then feloniously did express, utter and declare by divers overt acts and deeds and further, that you at Belfast aforesaid on 25th April 1936 and on divers other days as well before as after thatday together with the said others and divers other evil disposed persons, feloniously and wickedly did compass, imagine, invent, devise and intend to levy war against our Lord the King in Northern Ireland by force and constraint to compel him to change his measures and counsels; and the said last mentioned felonious compassing, imagination, invention, device and intent feloniously and wickedly did express, utter and declare by divers overt acts and deeds; contrary to the Treason Felony Act 1848. This wording was also used for the others charged under the Act listed below. In July 1939 he was detained in London, brought back to Belfast and charged with Treason Felony as documents found in a raid on his house on 15th January 1937 identified him as Adjutant of the Belfast IRA. Twelve days after the raid, the IRA shot the Belfast IRA’s Intelligence Officer, Joe Hanna, believing him to be an informer. After the raid McAllister had went on the run and ended up in London. During his trial, the court was read part of the 1934 Constitution and Governing Programme of the Irish Republic, reputedly found in McAllister’s Lincoln Street home in 1937. On 24th November 1939 he received 7 years. All were members of D Company present at 19 Getty Street when the RUC raided it on 15th August 1940. Dalzell and McMenemy had tried to escape over a wall with the latter being shot and wounded. All were tried and found guilty of treason felony and given seven years on 22nd November 1940. Arrested on March 9th, 1942. Both were charged with treason felony and there was a minor sensation about their case as both were Protestant. On 4th August, Thompson pleaded guilty and got six months while Smith pleaded not guilty to treason felony but guilty to other charges of publishing seditious documents and got nine months. McAteer and the others (captured at IRA publicity HQ on the Crumlin Road) were arrested separately but were effectively tried together for treason felony in October and November 1942. McAteer got 15 years, Graham and Fleming 12 years and Lynan got twelve months. Arrested after the raid on Omagh barracks on 17th October 1954, eight were charged with various offences including treason felony (ironically all were from the south). That December all were found guilty and received sentences of ten years penal servitude, apart from Boyce who received twelve years. The following article looks at sectarian violence in Belfast around the Twelfth in 1935 and the (apparently) coordinated raid by De Valera’s own special police on a Belfast IRA training camp in County Louth. It includes a brief chronology of sectarian violence in the summer of 1935 in the lead up to the Twelfth that was published in 1936 under the pen name ‘Northman’. It appeared in Studies: An Irish Quarterly Review, entitled ‘The Present Position of Catholics in Northern Ireland’ (the original can be accessed here). May 6: Bands were playing all the evening, shots were fired into the house of a Catholic, another Catholic, a woman, was wounded in Earl Street ; windows in St. Joseph’s Club (Dock Street were smashed ; in the early hours of the morning terror reigned in the Antrim Road area due to the activities of some 300 hooligans ; fighting followed ‘band’ activities at Peter’s Hill. May 9: A Catholic was shot through the stomach in Nelson Street; another Catholic was savagely beaten in Henry Street ; Catholic girls returning from work in mills were chased by a Protestant mob, which attempted to invade Pilot Street (a Catholic area) ; general intimidation of Catholic workers began openly; Catholic women workers were compelled to leave Linfield Mill owing to the hostile attitude of their Protestant fellow-workers and of the crowds in the street outside. May 10: Catholic workers were threatened and insulted on their way to work; a savage mob turned its attention to the Donegall Road area; owing to state of the city curfew was imposed. May 23: Mr. William Grant, M.P., was promised by the Minister for Home Affairs that, “if any member of the Royal Ulster Constabulary exceeded his duty,” disciplinary action would be taken. The question arose out of a complaint that the police had acted too drastically in restraining rioters in Grove and Vere Streets (Protestant areas). It is unnecessary to remark that the police did not afterwards “…exceed their duty…” but acted with that ‘forbearance’ for which they were commended by Lord Craigavon. May 30: Meeting of the Ulster Protestant League in Templemore. Avenue, at which the speakers and the audience lustily ‘kicked’ the Pope. After the meeting a rowdy ‘procession’ of the usual type marched to the centre of the city, and from this “procession a bomb was thrown into the Catholic area of Short Strand. May 31: Terror reigned in the York Street area. A band and ‘procession’ from across town attempted to invade Lancaster, Marine and St. George’s Streets-all Catholic areas. June 12: Meeting of the Ulster Protestant League at Queen’s Square, at which fiery anti-Catholic speeches were delivered. After the meeting the usual procession took place to various parts of the city, and their route was marked by acts of gross hooliganism particularly window-smashing. June 16: From 6 o’clock in the morning mobs were gathering, and there was heavy firing into Marine Street, Dock Street and other Catholic areas. Catholics proceeding to and from early Masses in St. Joseph’s were fired at by snipers. On this morning occurred the dastardly shooting of the 15 year old Annie Quinn on her way to Mass. For this crime a non-Catholic received three months hard labour. He swore to an alibi and produced witnesses to that effect, but later pleaded guilty. June 17: This was the worst night of shooting since the beginning of the trouble. Volley after volley was fired into the Catholic quarter of North Queen Street, wounding one man in the stomach. As a result of urgent appeals from various sections of the citizens to put a stop to the growing anarchy, the Government at last decided to take action. On the following day the Minister for Home Affairs issued an Order prohibiting all processions, other than funerals, and the assembly of any groups or bodies of persons in any public place within the City of Belfast. June 27: Four days after Sir Joseph Davison’s speech the Minister for Home Affairs gave way to Orange truculence and removed the ban on processions. It was clear who were the real rulers of Northern Ireland. Wild scenes-shootings, burnings, evictions, window-smashings, beatings-became the order of the day and the night. A strong appeal for peace by the Right Rev. Dr. MacNiece, Protestant Bishop of Belfast, had not the slightest effect. Another form of government apology is to say that the troubles were confined to one small section of Belfast and that the victims were Protestants, while the Catholics were the aggressors. it is true that the majority of the killed were Protestants; but there is no evidence whatever that they were killed by Catholics. Six of the seven were killed in the open when rioting was in full progress-none of them in his own home or in his own street. As to the seventh, there is good ground for believing that he was shot by non-Catholics for his sympathies with Catholics, with whom he was a great favourite in the district where he was shot. As to the Catholics, the facts are quite in contrast apart from those killed, there were twelve deliberate attempts to murder Catholics, and in five of these cases the victims were inside their own homes. That none of the twelve is dead is no credit to the assailants. But the number of the murdered is no measure of the sufferings to which Catholics were subjected. There was no security of life or property. Day and night the Catholics were in terror of raids, shootings, burnings, evictions. Let us take this last item. In all 514 families, comprising 2,241 persons, were driven from their homes. That account gives an idea of the background to events over the summer of 1935. However, it doesn’t make reference to the role of the IRA. Despite the overt threat of violent sectarian attacks, the IRA had continued with its annual summer camp at Giles Quay, just north of Dundalk. In 1932, the IRA had to recall units from the camp to provide defensive cover in districts that were under threat. In 1935, the IRA’s Army Executive recommended that the Belfast staff cancel the camp due to the potential for trouble in Belfast. In the end, the camp went ahead but an alert company from Ballymacarrett under Jack Brady remained ready to contain any problems. Jimmy Steele, as Adjutant, would be the senior member of Belfast Battalion staff present, while the Training Officer Charlie Leddy was to be the O/C for the camp itself. At the camp the men stayed in six bell tents and two hiker tents pitched alongside a stream known as the Piedmont river. The camp wasn’t particularly discrete. The IRA didn’t take much in the way of precautions and did little to conceal their activities or to provide security such as sentries. By the time the men had cycled the sixty miles from Belfast, an advance party had the tents erected and a meal cooking on the camp fire. In the mornings at a training camp, participants usually formed up for parade and drill. The plan for Giles Quay, over the course of the camp, was to deliver lectures on various military matters with opportunities to handle, maintain and fire weapons. This included live ammunition from rifles and revolvers, the chance to fire bursts from a Thompson gun and throw Mills bombs. On the Saturday at Giles Quay the volunteers had carried out drills, attended lectures and sat knowledge tests. Rifle practice took place using a sand dune as a target. That evening was declared a free night and some cycled off to Dundalk to find a ceili, while others visited people they knew in the locality. Jack McNally remembers that they were advised to be careful in Carlingford, which was considered a Blueshirt stronghold, to the extent that their accents shouldn’t be heard in the village. Around the same time as the IRA men were leaving the Giles Quay camp for the evening, the Orangemen were on their return leg from the field back to their homes. There had been shots fired in the area on the previous night. Before the Orangemen reached York Street, they had clashed with residents in the Markets and Stewart Street, where shots had been fired. As the bands passed Lancaster Street on York Street a confrontation soon escalated into a major riot around Lancaster Street, Middle Patrick Street and Little Patrick Street. Jack Brady had received a visit from a Mrs. Kelly of Seaforde Street (in Ballymacarret) and Sarah Trainor (from York Street) immediately after the trouble had broken out. They had came over to visit Brady and said there was shooting in Lancaster Street by the Orangemen on their way back from the Field. Mrs Kelly had told him it was desperate. Brady immediately rounded up thirty men with guns (IRA volunteers were already on duty and had been posted in pickets of 6 or 7). They went straight across the city and set up headquarters in Trainors Yard in Lancaster Street. By the end of the day, the hospitals reported 17 people with gunshot wounds, 20 with other assorted wounds and two dead. The RUC had opened up with Lewis guns and snipers had been reported firing from roof-tops around York Street. Whippet car mounting a machine-gun on patrol in York Street in 1935. While most of the men were away from Giles Quay for the evening, word arrived from Belfast for Jimmy Steele saying that there had been a serious outbreak of violence and that it was mostly focussed on York Street. Steele wanted to take A Company, which covered York Street, back to Belfast along with any other units that wanted to leave. Those present discussed the situation until around 2 am, when Jack McNally returned from visiting a friend in Omeath. Since McNally was on the Army Executive and the most senior IRA man present, Jimmy Steele waited on McNally to get his opinion before a decision was made. McNally checked on the reports from Belfast and pointed out to that, since they had no word of casualties (as yet), the men should go to bed and get up at 6 am, strike camp and head to Belfast. If they were stopped anywhere, they were to say there were a cycling club from the Markets on their way home. When the IRA volunteers woke in the morning they found large numbers of Garda, including the non-uniformed special police detachment set-up by De Valera and known as the Broy Harriers, walking up to 40 abreast in a wide sweep across the camp. The Broy Harriers detained a large number of the Belfast IRA volunteers and seized their weapons despite protests that both were needed immediately in Belfast. When the IRA men were brought up in court in Dundalk to receive their detention notices they refused to answer their names. Many, like Harry White and Bobby Hicks, gave false names and addresses (a favourite being Craig Street – a tiny street with one occupied house). You’ve done great work, but we’ll take over from here. The riots, house-burnings and work-place evictions lasted for a further two weeks, leaving ten people dead, seven of whom were Protestants. Funerals, and funeral processions became the pretext for fresh outbreaks of violence over that period. By the 16th July, the violence spilled over the border as attacks and graffiti began appearing on Protestant-owned businesses in the south demanding they make public calls for attacks on northern Catholics to cease. While the attacks were largely uncoordinated, the Blueshirts appear to have been involved in a number of them (the IRA had no role in this campaign). At the end of July all twelve arrested at Giles Quay were sentenced to two years in Arbour Hill at the Military Tribunal sitting in Collins Barracks. On their release, they found that their details had been passed on to the RUC. Any illusions the Belfast IRA might have still held about De Valera and Fianna Fáil had been quickly dispelled by their experience. Within a couple of weeks of the Twelfth of July the level of violence dipped, but the memory of the 1935 Belfast pogrom (as it was regarded) was still fresh thirty-four years later in 1969, in Belfast (as indeed, were memories of 1920-22). This memory included the scale of the violence, and, around North Queen Street, even details such as the absence of the IRA at its outset. Another result was that the National Council for Civil Liberties began an investigation of what had happened. This was published in 1936 (I include a quote from it’s report here). Finally, some sense of the geography of the violence across Belfast in July 1935 is shown by a table included in ‘Northmans’ article. 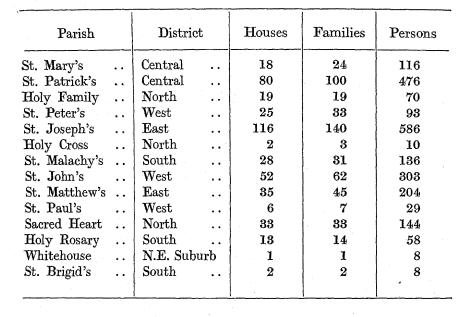 Evictions in July 1935, as listed by Northman, by Catholic parish in Belfast. For more on this, see the previous post here. Here is some audio from Jimmy Steele’s speech at the Barnes-McCormick re-burial at Ballyglass cemetery, Mullingar, on the 6th July 1969. You can view some footage of the reburial here.